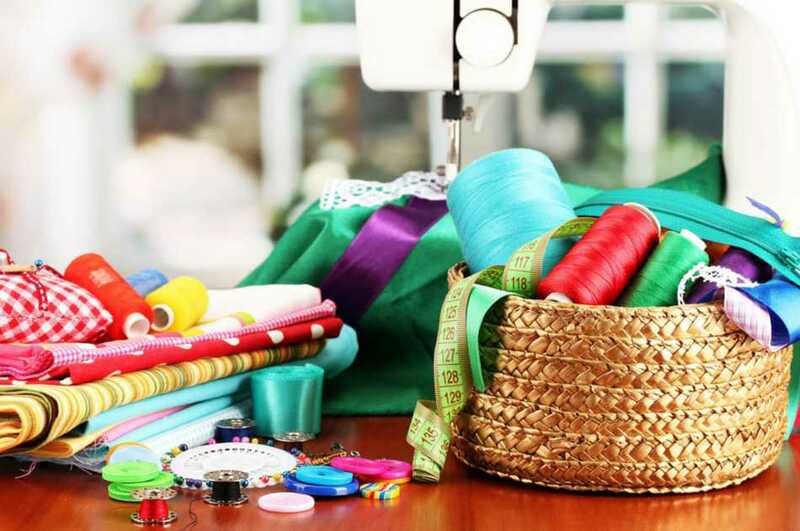 Are you thinking which sewing machine to buy? Well, certainly your visit to the website says so. Buying sewing machine is undeniably a daunting task especially for the people who are making a first time purchase. Unlike the experienced, the mechanism paired with its buttons and knobs might be a nightmare for you, but today’s popular models are designed in a way to make working simpler. The manufacturers not only have made it convenient for the users but also understandable for the beginners. Irrespective of commercial or residential purpose, the great news is these models are much easier to operate, comprehendible and its affordable price tags are an additional benefit. Since it is completely for the beginners, easy operation is a necessity. Until and unless you have complete knowledge about the operations, it can proffer a disastrous result. However, in such a huge list of options, selecting the appropriate model can be a tedious job without any assurance of acquiring a successful result. So here is a quick list of the top models of sewing machines that are meant for beginners. These are designed as per the skill along with focusing entirely on making it user-friendly. Let’s have a look. Manual vs. Computerized: Which one is better? Why Buy A Sewing Machine? 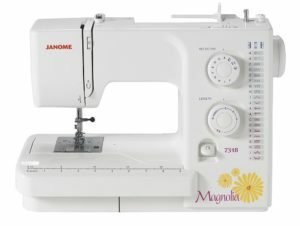 What to Look For When Buying Sewing Machine? Brother XL2600I sewing machine can be a good choice for the beginner sewers because of their features. Manufacturers of this model have made understandable with its easy to use and learn mechanism. Furthermore, its compact design makes it lightweight and the instruction manual guides you throughout from its basics to custom-sized buttonholes. 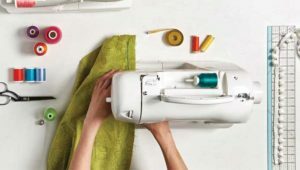 Being a beginner, unquestionably you will opt for simpler jobs like crafting, quilting, altering, home décor and etc which can be thrown to this machine without the stress of getting damaged. Well, there is no doubt that adjusting the thread and bobbin is one of the most daunting tasks, but this model has dissolved it all with its top drop-in bobbin. All you need to do is to drop the bobbin, pull out the thread from the slot and you are ready to start sewing. What could be easier than the auto needle threader that comes with it? Nothing, right? Yes, you are reading it right. All you have to do is to follow the instructions printed on it and then the needle threader will take care of it. No more you need to adjust as just by turning the dial that comes with this model can do it all for you. With a 4.5 rating from 5, this beginner sewing is a total value for money. 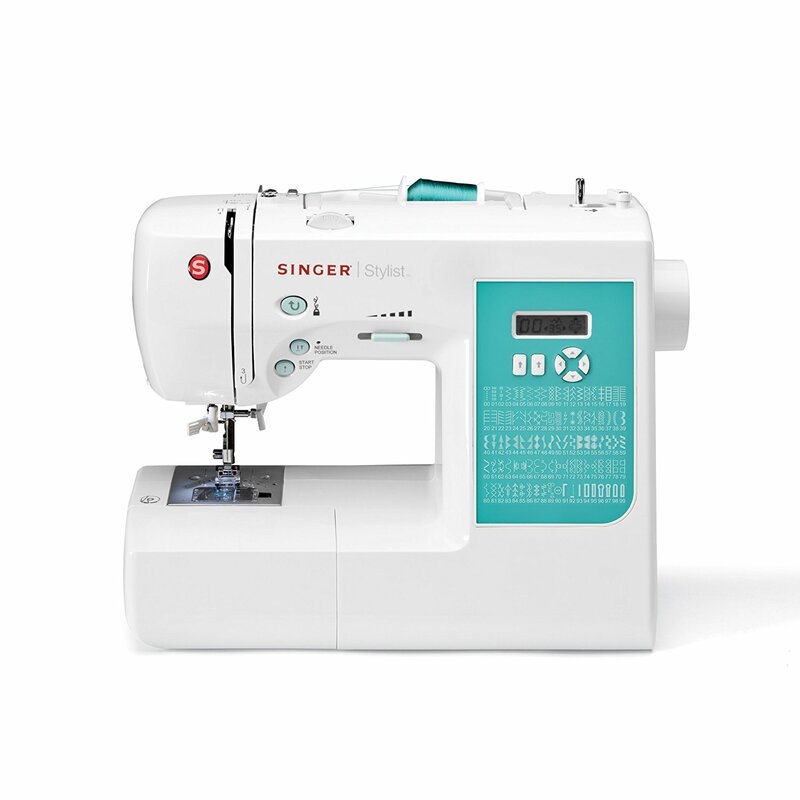 With exceptional features and easy manual help makes sewing fun. Some people find an experienced problem with the lower thread but the manual makes it easy. Other than this, users have mostly appreciated this fantastic invention. 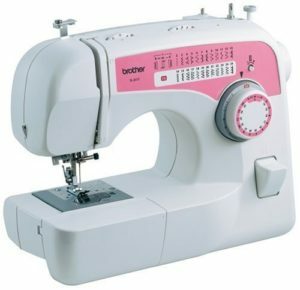 Brother XL2610 is a free arm sewing machine with 59 stitch function and 25 built-in stitches. Its free arm is an added advantage for sewers because you will be able to work with pant legs and cuffs much easily. The built-in stitches have made sewing easier than ever as it includes garment construction, quilting stitches, stretch stitches, decorative stitches, blind hem and garment stitches. The accessories included with it ease zipper insertion, quilting, sewing buttons and much more. Moreover, the thread tension control, lightweight, light switch ensures a great result. 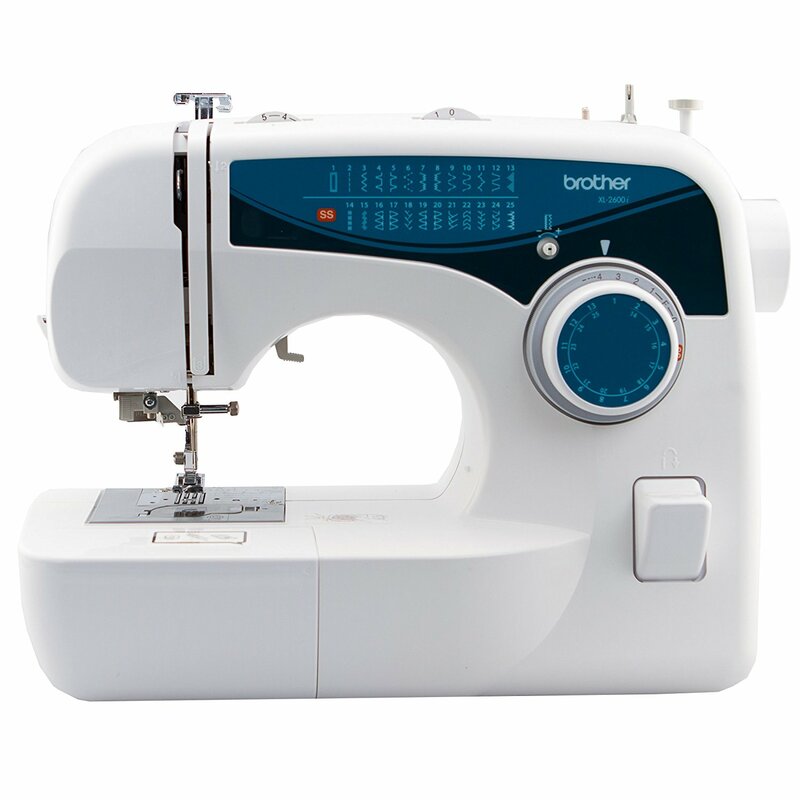 Brother XL2610 has 25 built-in stitches along with 59 functions that endow with different sorts of designs. It is definitely a good choice for people are indulged into embroidery. This is one of the biggest benefits of using these ultra-advanced models. The automatic needle threader makes it easier for sewers as you simply require pulling the lever down. Post this, the thread will be automatically routing through the needle eye thereby saving you from the hassling procedure. For the sewers, this is a very handy tool as it facilitates sewing without facing any hassles. Its twin needle functionality not only strengthens the stitches but also makes sewing procedure faster helping to get the job done within the least time frame. It comes with 25 years of warranty for the Chassis casting, 2 years for the electronic parts and 1year for the other accessories. The warranty is counted from the date of purchase. This machine has been rated with 4.4stars while some users are not satisfied with it. Except a few, most of the users found it valuable for them. It has been reviewed by most of the users as a great beginner machine. So, 4.4-star ratings are definitely justified when it comes to features and functionalities. 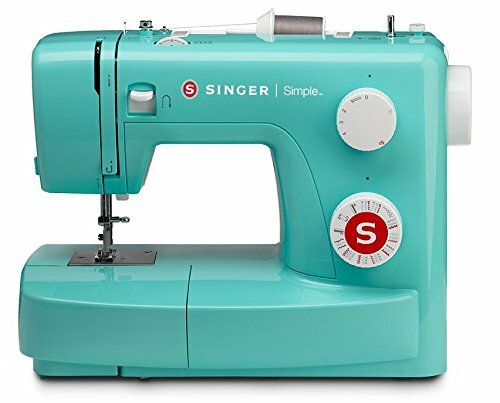 Singer Simple 3232G has made sewing easier and a fun thing. This is designed for beginners and therefore its features are greatly helpful for first-time sewers. It is a machine that will provide a kick-start with its easy threading, free accessories, convenient set-up and simple stitch selection. 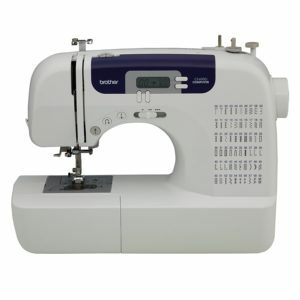 This excellent sewing model comes with 4-step auto buttonhole, 23 built-in stitches and the adjustable stitches. Investing on this machine will never let you down. The threading instructions provided on the right side of the machine ensure easy threading to the sewers. Undoubtedly, threading is a challenge to eyes which definitely gets resolved with this high-end sewing machine. No more you require keeping your mind on various things as changing is easier with the snap-on pressure feet. Screwdriver is not required anymore and therefore it becomes easier for you. There is no doubt that being a sewer you have to select various stitches in order to acquire perfect results. With the easy dial selector, you just have to select and get ready to sew. it comes with 25 years of warranty for the machine head which is itself a symbol of superior quality. 2 years of warranty for the electronic parts and also 90 days for the adjustments. With excellent reviews from users, the model was rated with 4.3 ratings. Starting from its designs, looks, additional accessories and functionalities, users are overjoyed with this sewing machine. Furthermore, it is mostly appreciated as a beginner’s machine due to its built. Investing on this will never leave you empty-handed. 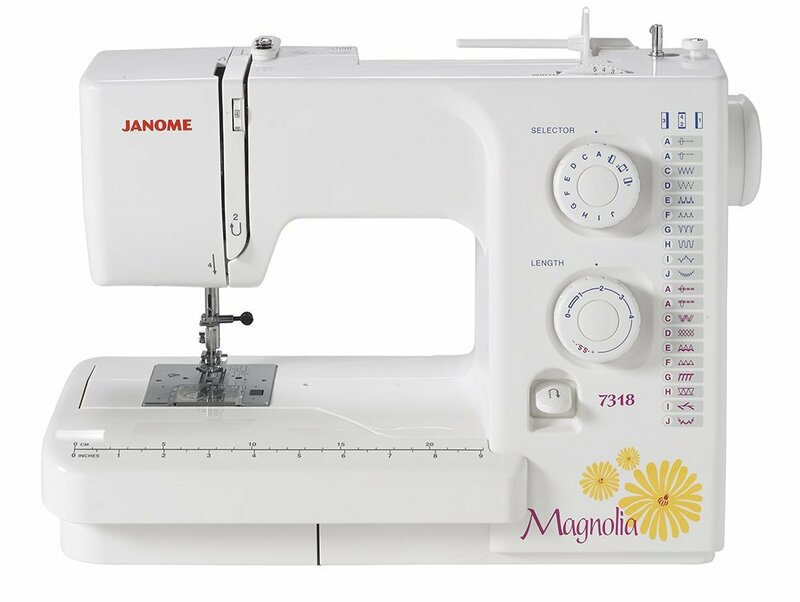 Janome Magnolia 7318 has some of the commendable features which fit best for the new sewers. Including this can be the best decision as it fits perfectly for all type of projects like home décor, garments, crafting, quilting and much more. It comes with an easy stitch panel along with gives you the freedom to adjust length and width as per your need. With the see-through, you can observe whether you need more thread or it is still working. This is a sewing machine that fit best for multiple layers of fabrics with an ease. Undoubtedly, for sewers adjustment is the primary job in order to acquire a flawless result. Here you get the freedom to customize the stitch in terms of length and width. The stitch width varies from 5mm width to 4mm of length. The reverse lever present in this sewing machine makes locking stitches easier. It is easy to reach which makes it best for beginners. You can sew without any hassle. Stitch selection is important and making is convenient is much more required for the amateurs. The selection dial makes stitches easier because of the clear and simple dial present. All you need is to just select and you can work without further thought. This particular model comes with a 2-year warranty on electrical parts and 25 years on other parts from the date of purchase except for needle plate, bobbin case, knives, rubber parts and light bulb. Any parts found defective within the warranty period will be replaced. With most positive reviews appreciating its smooth sewing, design and warranty, this sewing machine has been rated with 4.4 stars by the users. This, itself is the best way to determine the quality. Its extraordinary capability to sew and remain user-friendly for beginners makes it a valuable choice for people. 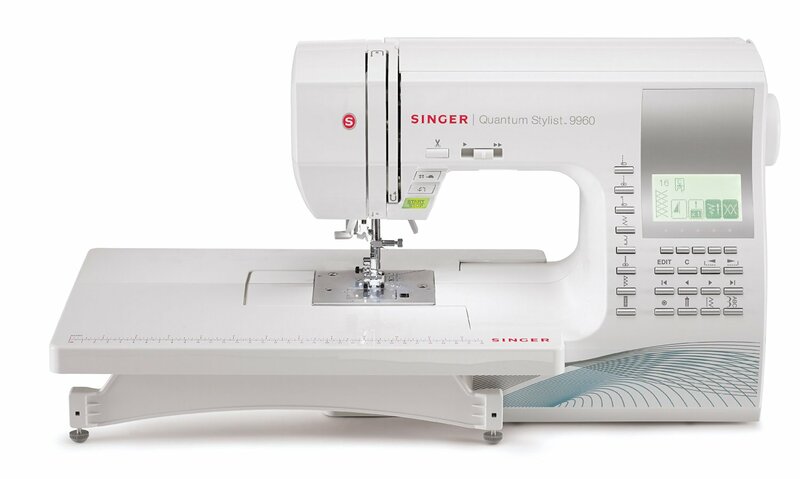 Brother CS6000i is another machine for the beginners which have huge numbers of quilting and sewing features. With the 60 in-built stitches that include 7 styles one-step buttonholes and decorative stitches, it makes large projects done with an ease. This sewing machine has some of the advanced features and complete manual that makes sewing fun and simpler for people. Advanced features are always blessings for us. The LCD display allows you to select stitch as well as style just in a touch. It’s convenient and helps you to keep an eye on everything that has been selected. All you need to do is to follow the instructions printed on your machine and in no time your machine will be threaded without any stress on your eyes. In order to successfully complete larger projects you need that additional space. This sewing machine is completely designed for larger projects because of the additional space you get to sew conveniently. In order to understand its class, warranty and reviews can be the best determinants for you. The warranty period initiates from the date of purchase. 1 year for labor, associated accessory items and components, 2 years for the printed circuit boards (excluding replacement labor) and electronic components and a long 25 years for the chassis casting. Customers are highly satisfied with this sewing machine because of its features. It has probably encompassed all the required areas for comfortable sewing and larger projects. With 4.5 ratings, this machine itself reveals its excellence and worth. Singer 7258 Stylist have an array of amazing features which has a lot of impact on creating an elegant piece of cloth. 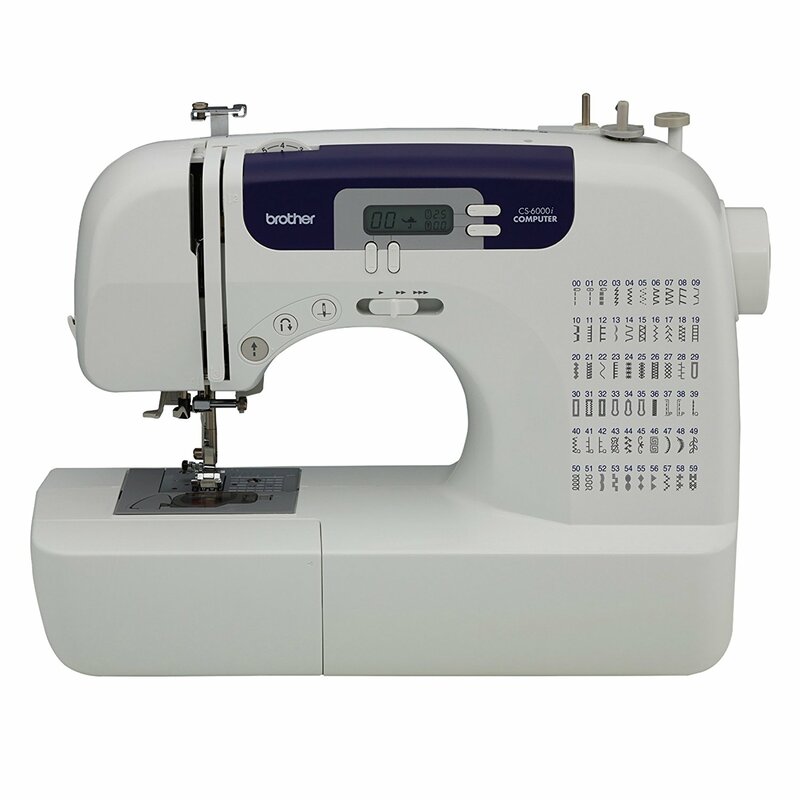 With the 100 stitch patterns that includes automatic 6 styles one step buttonhole, adjustable stitch width and length, automatic threader, top drop-in bobbin and much more appreciable features, this machine can do wonders for you. For user convenience, the manufacturers have even taken care of the cord size making it to 69inches long. Well, this might sound dreamy but in actual this machine has made threading so easy that you can get overall machine threaded within six seconds. With all the instructions properly mentioned on the machine, it not only makes it convenient but also saves huge time. This machine has easy top drop-in bobbin system hence you can load the bobbin from the top which makes loading easy. The clear cover makes monitoring easy for users. You can select from the six different buttonhole styles. Doesn’t matter how many you want to create, you get the freedom every time. One extra buttonhole helps to make infinity long sides. This sewing machine comes with a 25-year warranty for the sewing machine head, 5 years for electronic parts and 1 year for the attachments and adjustments. With such a long warranty period, you can remain assured that you are making the right investment. With 4.5-star ratings, this machine guarantees that it is worth every penny. Customers have appreciated its features along with the designs that this machine has. Not only it is apt for a larger project but also the instructions provided make it easy to work for the beginners as well. If you are looking for advanced and easy to use a sewing machine, then Singer One Plus is the ultimate choice for you. The advanced features open the door for more than what you want. This computerized machine is beyond what you can image and almost surpass all the possibilities. 221 built-in stitches and additional space along with automatic buttonholes make it a good choice for both beginners and experts. Undoubtedly, to carry heavy duties there is always a need for a heavy metal frame which this sewing machine certain surpasses. It ensures precision and durability, therefore, ensuring its worth. This machine is built to make sewing convenient for users. With its top drop-in bobbin, you no longer need to take the thread prior to sewing. All you need to do is to drop and start sewing. With an extra working space for the sewers of 14.7inch, this machine has probably surpassed all the requirements. Since there is always a need for additional space for sewing home décor, quilting or other larger projects, the space provided fits perfectly for your job. There is no doubt about the quality of the sewing machine and this is the reason why it comes with a 25year warranty. With all its parts made with precision keeping in mind about the convenience, this machine is the top choice for people looking for quality within the budget. Even when the ratings are 4.3 stars out of 5, the features of this machine are totally top class. The outstanding design, additional space is appreciated by the user while some other faces issues with stitches after a year. Inconsistent stitches have been a problem for a few. 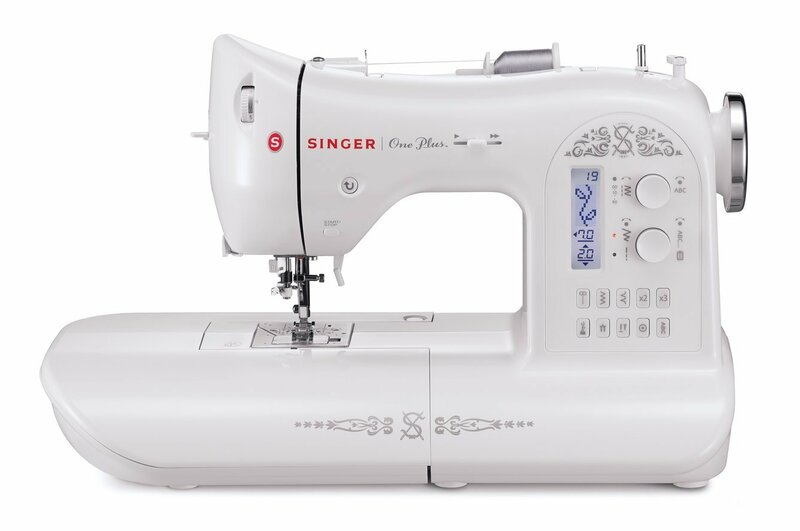 The SINGER 9960 sewing machine has more than what you can get from an ordinary one. With 13 automated one-step buttonholes and 600 built-in stitches, it gives a huge customization option to users. Automatic tension, extra space to sew larger projects, twin needle control LCD screen and other exceptional features make this machine the perfect choice for the users. Well, this time sewing will really be fun. With the automated needle threader and easy threading system this machine has made threading a lot easier than one can even think. Just read the instruction and you will be able to find the perfect way to use it. Unlike the ancient machine that was a hazard both for the brain and hands; this advanced sewing machine comes with a digital advisor. The information includes stitch length, chosen built-in stitches and width settings. Everything is displayed on the LCD screen making it easy for you to understand and fewer chances of mistakes. The extension table included in its feature list offer additional sewing area for the sewers. This is a blessing for larger projects. With a 4.3start rating, this machine definitely can be a good choice for you to sew larger projects. 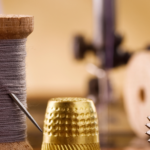 However some users have experienced bobbin jamming, it is still one of the best computerised sewing machines that can do wonders for your project. 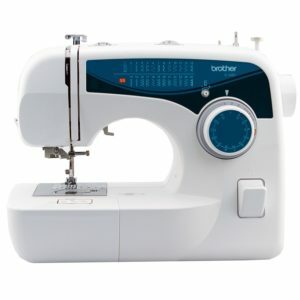 With the emergence of computerized and manual sewing machines, the only doubt with beginners is which one to buy! Well, both has its own set of advantages and disadvantages. It is completely based on their personal experience and how comfortable users are working with it. 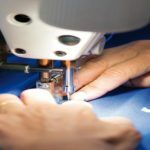 With automated features, ample of stitch options, better speed control, a couple of automated buttonholes and other features, computerized can be a good choice for people who are more into sewing for years. For beginners, it can be a bit complicated but definitely the manual that comes with it become a helping hand for them. On the other hand, the manual sewing machines do not have all the advanced features which mean you require putting more effort while are easy to maintain and come with a lesser price tag. My advice is to purchase a machine according to your skills and requirement. Undoubtedly, everything has its own benefits but the better decision lies in making the purchase after reading the features thoroughly. Get something that is worth every penny by understating whether you will be able to work with or not. 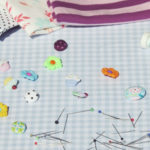 Do you love to sew or you hate stitching with needles? Well, no matter whatever the situation is, sewing machines are handy for people. With the evolving designs and need to go with the trend, sewing machines can always be a better choice as you get the opportunity to customize your own clothes. Since these advanced stitching machines come with dozens of features, it helps in making your own finishing. No more you need to rush to a tailor to repair your torn cloth, as you have the magical wand with you. It is not only easy but also faster than you can think. You can repair everything that once you have thrown into the garbage along with making further designs to make it looks commendable. Trend is constantly changing and the more you use your own creativity, you can start your own trend. No more you need to rush every time to malls, you can stitch your own patterns. If sewing is your passion and your job, nothing like a sewing machine can be a better solution. Get a machine as per your requirements and you are ready to give your business a kick start. There is no doubt that these days the sewing machine have a huge number of features. Prior to making a purchase, you need to go through the features properly in order to comprehend whether it is apt for you or not. One of the most important things that you need checking is the stitch types. For a successful result, you require zigzag and straight stitches as this allow doing everything that you are looking for. However, you can check thoroughly in case you need other types. Well, if you use it for commercial purpose you definitely need to check the attachments. For clothing purpose, look for a zipper foot, blind hem and buttonhole foot. For making quilts, look for walking foot and for basic sewing, check for zigzag stitches and different width. When you are seriously into sewing, you require a sturdy motor and a strong machine to imbibe the abusive usage. Upholstery and denim are undoubtedly heavy and hence require a sturdy motor for a successful result. Well, as we have discussed earlier about the mechanical and computerized sewing machine while buying you need to check it in order to get valuable results from your investment. 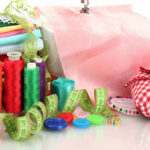 For beginners, manuals can still work but if you are solely into sewing then the computerized machines can do wonders. 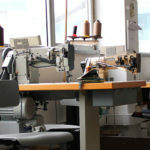 Unquestionably, for sewing machines, you require getting the right machine for you. Above listed are the top rated machines that have the capability to make a successful project for you. But prior to that, you need to understand what you need and the features apt for your purpose. All the products are efficient and highly capable of providing a good result to you. 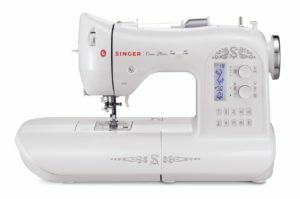 As a final verdict, I would suggest you to purchase the sewing machine that fits your budget while having all the required features that can make a successful job. Sewing is undoubtedly hard and a tedious job, but these machines can definitely do it all without getting you into hassles. Happy Sewing! Hope you will make the best choice.